In this age of Instagram, Twitter and Facebook, people’s lives seem to be fully on display, feeding our exhibitionist and voyeuristic tendencies at the same time. To be seen and to see has come to define our times. Yet, viewing US-based artist Byron Kim’s “Sunday Paintings” series at the Kukje Gallery in Sojeok-dong, Seoul, is an oddly discomfiting experience. In a series of 35.5 centimeter-by-35.5 centimeter canvases, the artist depicts the sky over wherever he may be on a given Sunday and writes a journal-like entry or thoughts of the moment. Yet, the sky and clouds do not seem at all affected by his mood. It is calm, almost serene. Through the paintings which are accounts of his Sundays, or more likely accounts that he is willing to share, viewers unwittingly become privy to the artist’s intimate life, involving his family and circle of friends. In fact, it is hard to resist wondering why Kim feels so “crappy” on Dec. 14, 2007. Yet, the artist lets you in on only just so much that it feels as if a door has been shut on you. Kim began the “Sunday Paintings” in 2001, committing himself to a single painting of the sky every Sunday. Despite their casual nature, the writings are precomposed before they are written on the canvas. In fact, Kim is precise with even his spoken words. Perhaps this is hardly surprising from the artist who majored in English literature at Yale University and had hopes of becoming a writer. Does that explain his name, Byron? Did he pick it out himself, as many Korean-Americans do, to complement their Korean names? The explanation for his name is rather mundane, according to Kim. When Kim was born in La Jolla, California, in 1961, his father went through a book of names. He wanted his baby boy’s name to start with “by” and he happened upon Byron. Whether inspired by his name or not, Kim went to Yale where he studied American transcendentalists and 19th century English poets, such as William Wordsworth, William Blake, John Keats, Percy Shelley and, of course, Lord Byron. He wanted to be a poet, but at Yale, because it was so competitive, he became self-conscious and abandoned the idea. Although he had not studied art at school, he decided to become an artist after college. “I naively thought I could become a poet through becoming a visual artist,” he said during an interview with The Korea Herald at a cafe inside the Kukje Gallery earlier this month. In this, he was influenced by the New York School of painting of the 1970s, he explains, describing it as combining art and poetry. 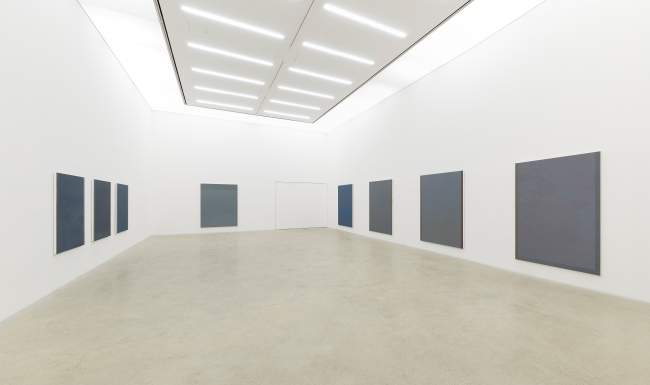 “Even if I do very abstract painting, so far, there has always been some other meaning than the color itself,” he said. “From the beginning, I always sought to add something to the modernist form. Modernism seems to tend to support existing authority with regard to power. The “Synecdoche” series at the National Gallery of Art in the US, which he began in 1991 and continues sporadically, is an apt illustration of his attempt to imbue meaning to color. The more than 400-panel series is a careful study of skin colors of the people around him. “It began in the early 1990s and coincided with a real push towards more diverse multicultural situations. In the past couple of decades, I didn’t do it too much,” he said. “I recently picked it up again in response to the kind of repression that is happening now,” he added, in reference to the political and social climate in the US now under President Donald Trump. Kim notes that working serially has its advantages. “Working serially allows one to juxtapose one’s work against the passage of time. Interpretation can evolve, and parallel interpretation and reinterpretation are possible,” he said. Then there is the more practical advantage of being able to improve. “I am always dissatisfied with my work. There is always something to improve and working serially allows me to make it better,” he said. Kim guessed that most people take the sky for granted. For him, it represents everything, but he doesn’t know much about it. He studied the sky and now he knows the physics of why it is there, but he said that he still doesn’t quite understand it. 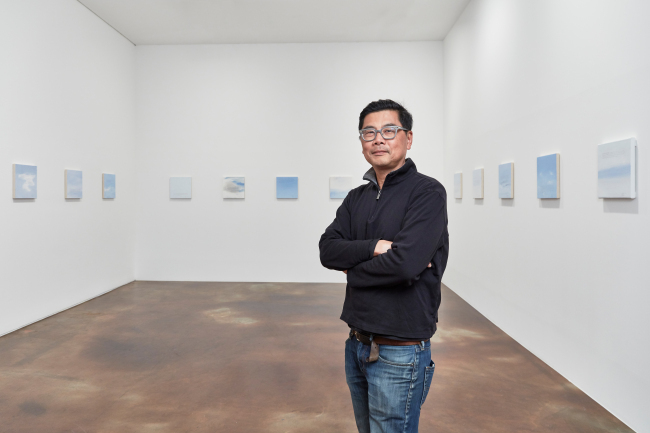 “The writing is juxtaposing something small with something very large,” said Kim about the “Sunday Paintings.” Taken in together collectively, as at the Kukje Gallery where they will be on show until Feb. 28, they are squares of various shades of blue and grey with varying shapes of clouds on which there are a few lines of texts. Over the years, he has taken care to write on different parts of the canvases so that they do not become monotonous lines when hung together. “If I don’t like part of a painting, I cover it with words,” he said. His commitment to painting every Sunday has seen him paint in different locations and cities. He has painted on a plane and on a bus to Seoul from the airport. The square canvases he uses are sized to fit inside a carry-on bag and he uses acrylic paint because it dries quickly. It is all designed to be easy, so they could be made every Sunday, Kim explained. “It is no different from any person’s identity,” Kim said of his identity as a Korean-American. “It influences my work because that’s who I am. But it is also not who I am. It is very fluid,” he said. Unlike many Korean-American parents, Kim’s parents, who were both physicians, never said “You need to do this,” Kim said. “I am telling my kids, it would be good to have a trade that the society needs. Artist isn’t one of them. Society needs art but not every artist. Society needs every doctor, teacher,” he said.